There’s nothing about this amp that doesn’t live up to the hype surrounding Soldano which is definitely what you would expect from the list of legends that use the amps. All the power, tone, and versatility one could ask for makes this one of the most inspiring amps out there. This one is in perfect condition and a rare find as Soldano is retiring soon. 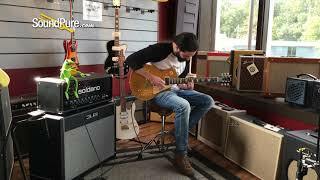 In this video, Sound Pure electric guitar specialist Michael Buckley showcases the Soldano Hot Rod 100 amp head by using a Gibson Les Paul Gold Top and a 3rd Power cab. Classic American hot rods and guitar amps. In both cars and gear, pursuing the perfect look and performance can be time consuming and expensive. Where amplifiers are concerned, random tinkering doesn’t always produce perfection. The HOT ROD 100 PLUS gets you there right out of the box. This high gain, two channel amp comes fully loaded with the most asked-for modifications built right in. With circuitry based on the legendary SOLDANO 100w SUPER LEAD OVERDRIVE, the HOT ROD 100 PLUS offers all the tonal range you want with all the mods you’ll ever need. The HOT ROD 100 PLUS features a tube-buffered effects loop and effortless noise-free channel switching between the Normal and Overdrive Channels. There are independent Preamp gain and Master Volume controls for each channel. Bass, Middle, Treble, Presence, and Depth controls provide the tone shaping. A rotary Impedance selector switch allows the use of 4, 8, or 16 ohm speaker cabinets. Here at Sound Pure we hand-select used and vintage pieces of gear for our inventory. Our used selection always reflects the high standards of quality and craftsmanship that we expect from all of our manufacturers. We are a small team of dedicated experts, located in Durham, NC. We buy, trade, and consign instruments that we truly believe in. Because of this, we have developed a reputation of quality and trust with our customers, located all over the world. Our best customers are the ones that truly understand our personal touch and commitment to everything we sell, and range from hobbyists and enthusiasts to some of the biggest names in the business. Our passion bridges the products we love with the real relationships we develop with our customer - whether they are a lifelong musician, or they are just getting started on their musical journey but care about value, quality, and being treated right. We vigorously test everything we take in to ensure authenticity, functionality, and reliability. We are supported by one of the most well-respected luthiers in the Southeast, guaranteeing products that come in are thoroughly vetted, and that products that go out our in premium, performance- ready shape. We are so confident in our ability to provide the highest quality music equipment in the industry, we even invented our “Try Before You Buy” program where we can ship out a product before collecting actual payment. Sound Pure's inventory is constantly changing, ever-evolving, with some items sold before reaching the website. Looking for something specific? Have questions about this product's condition or history? Want more photos, or to simply chat with an expert who's had his hands on this actual piece of gear? It is truly our pleasure to talk with our customers, please do contact us now. VOVOX Link Protect A Instrument Cable 11.5 ft.